You should have seen me during the Bloodborne announcement at Sony's presser. I lost all of my British decorum and let out an involuntary whoop. But the trailer left me wondering what the game actually was - it had all the gloom and gore of a Souls trailer, but we saw no gameplay. Turns out that Bloodborne is so much like a Souls game it's spooky. The E3 demo opens with the main character rising from a stooped position, exactly like the Souls avatar does after every death. 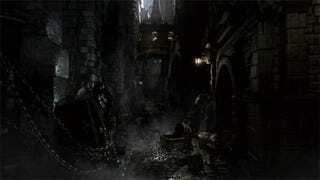 The animations and sound effects are identical to Souls 2's - there's a backstep, a kick, a roll, ragdoll corpse physics, floating flames over corpses with items hidden on them, a torch... early on in the demo an undead came crashing through a wooden barrier with that exact same sound of collapsing wood that's all too familiar to every Souls player who's ever been caught by surprise by a Hollow. When the first enemy was slain, I heard that familiar whoosh of souls being absorbed. It's even got a struggling frame rate (though that will presumably improve with time). Bloodborne is being made by the same team at FROM Software that brought Dark Souls 2 into the world, and the similarities are both comforting and eyebrow-raising for any fan of the series. 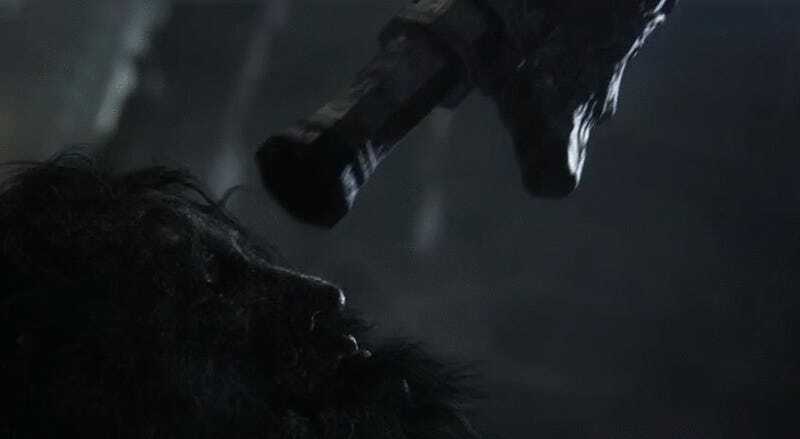 There's one thing that should give everyone confidence in Bloodborne, though: it's under the direction of Hidetaka Miyazaki, the series' creator, who passed on direction of Dark Souls 2 in 2012 so that he could work on this with Sony. It's clearly using plenty of Dark Souls 2's animations and sound effects (at this early stage, at least), but its world is completely different. It's set in an impressively gothic town, all looming, craggy towers and imposing churches, the building all pressed up against each other and blocking out a dark sky. The people and... things that live here are, unsurprisingly, not friendly. Townspeople clad in quasi-Victorian apparel - long coats, elaborate hats - lumber around the streets, attacking on sight. In the distance, a crowd of them gather around some crucified monster as it burns on its cross, watching wordlessly. It is profoundly chilling. I was gripped by curiosity at what was going on here, battling with a simultaneous urge to run away and never look back - exactly the same feeling that I get upon entering some unknown area in Souls. The ruined town extends out in several directions. Like Souls, Bloodborne does not tell you where to go, and like Souls it does not hold back on punishing you for wandering in the wrong direction. Crazed townpeople throng the main roads, far too many of them to cut through. Our demonstrator picks a path around side streets and over bridges, cutting through the lone enemies he finds there. The blunderbuss is interesting - it has no range, but if you let it off just in the instant before an enemy attack hits, it brings the aggressor to their knees and lets you despatch them more gruesomely, rather like Souls' counter mechanic. It looks practically open-world. Fog-gates will apparently still exist, says the Sony producer, but I didn't see one sectioning the world off. There's barely any light coming from anywhere; torches flicker in braziers and in the hands of dead-eyed townspeople, and there's illumination from a pale moon, but inside buildings it is absolutely pitch black; you can only see with a torch of your own to pick out the terrors in the dark. I'm pretty taken with this game, if that wasn't obvious. I discovered Demon's Souls when I was living in Japan back in 2008, back when it was an Asia-only game put out on the quiet by Sony, and the series is deeply special to me. Bloodborne has, for want of a better word, the soul of a Souls game, but it's not just another sequel - it's something new, taking that eeriness and incomparable visual design and bloody combat and sense of mystery and doing something different with it. What proves its calibre, for me, is the sound design. There's music, if it can be called that - creepy choral notes and strings - but the incidental sound design is what makes the unmistakeably a FROM game. The townspeople gurgle and scream, footsteps echo, blood spurts and squelches, the sound when a cleaver connects with some monster's flesh is enough to make you wince. A door shudders as some horrible thing on the other side of it bangs on the wood and moans. I wasn't prepared for the first boss, though. Nothing could have prepared me for that. After making his way through the town, our demonstrator ends up on a bridge where townspeople are fighting monsters - messed-up undead dogs, massive crows with bloodied beaks that drag themselves along the ground on their bellies (there's something so disturbing about that). Towards the end of the bridge, though, something massive and horrendous climbs up to meet him. It's... I can't even describe it. It's like a massive undead goat demon, its ribs exposed, one side of its monstrous body covered in hanging moss. But the heart-stopping thing about it is the sound. It emitted this unbelievably discomfiting, echoing scream that sounded like it was coming from somewhere underwater, a sound that got louder and reverberated more intensely with proximity. Within about twenty seconds it had picked the blood-soaked protagonist up in its horrible claw and thrown him off the bridge. This is what I want from Bloodborne. I want to be disturbed and surprised and challenged - not just by the game's difficulty, but by its subtlety and mystery and all its various horrors. Almost all other dark, gruesome fantasy design pales by comparisons to Souls. There is great beauty in the death and decay of Demon's and Dark Souls' worlds and great majesty in the bosses that inhabit them. The second I saw the heart-stopping boss at the end of this brief section of Bloodborne, I knew that this was a Miyazaki game, and that it will show me things I've never seen or dreamed of.